Environmental factors have long been known to influence large-scale species distributions but may differentially affect species with multiple life history stages. 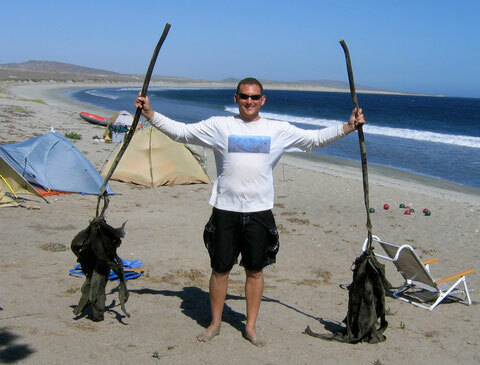 During my Master’s work with Dr. Matthew Edwards at San Diego State University, I explored the large-scale biogeography of kelps in the eastern Pacific Ocean. My thesis work was divided into two separate approaches: (1) using a multiple life-stage perspective to investigate how temperature and nutrient availability differentially affect the southern limits of the stipitate kelp species Pterygophora californica and Eisenia arborea (Phaeophyceae, Laminariales), and (2) investigating morphological variation in E. arborea across a latitudinal gradient along the west coast of North America. Specimens of Eisenia arborea collected along the coast of Baja California near San Roque, B.C.S.